Rapper DMX was sentenced to 90 days in jail Friday for convictions on theft, drug-possession and animal-cruelty charges. DMX, whose real name is Earl Simmons, also was placed on at least 18 months' supervised probation by Maricopa County Superior Court Commissioner Phemonia Miller.Simmons pleaded guilty Dec. 30 to three felony counts—theft, possession or use of marijuana, and possession or use of narcotic drugs—and one misdemeanor count of animal cruelty. The 38-year-old rapper has been in the Maricopa County Jail since being arrested Dec. 9 in Miami on a warrant after failing to appear in court in Phoenix. His attorney, Stephen Lee Crawford, didn't immediately return calls seeking comment. The Arizona Republic reported that Simmons was smiling as he entered the courtroom but sat down writhing in pain and subsequently said he had pain in his feet and knees and thought he was suffering from gout. Miller told him she was sentencing Earl Simmons, not DMX, the newspaper reported. "I don't know DMX. Mr. Simmons, it's time you do something different," she said. "What you have been doing is not working." Despite the prosecutor's objections, Miller said she would allow Simmons to apply to serve his sentence in Florida, the Republic said. The animal-cruelty and drug charges stem from an August 2007 raid that Maricopa County sheriff's deputies conducted at Simmons' home in Cave Creek, a Phoenix suburb. Authorities investigating a report of animal abuse found three dead dogs, guns, ammunition and drug paraphernalia. He was not given credit for time served and will not get out of jail until the end of April, said Mike Anthony Scerbo, a spokesman for Maricopa County Attorney's Office, which prosecuted the case. DMX's albums include "It's Dark and Hell is Hot," "Flesh of My Flesh, Blood of My Blood" and "Year of the Dog ... Again." Vivian Blake arrived at the Norman Manley International Airport about 12:20 p.m. after being deported from the United States. Vivian Blake, reputed leader of the notorious Shower Posse gang, returned to Jamaica yesterday. The 53-year-old Blake arrived at the Norman Manley International Airport about 12:20 p.m. after being deported from the United States.Blake was sentenced to 28 years in Federal prison in June 2000 in a Miami Federal Court. He had been indicted there 12 years earlier but American authorities said he fled to Jamaica, by boarding a cruise ship in Miami, where he remained free until his arrest in 1994. Dressed in a black suit and a white shirt, Blake was transported from the airport to the CIB headquarters, downtown Kingston, where he was processed and released.Blake told reporters that he felt "great" being back home. "At least I come to see my family," he told The Gleaner/Power 106 News.He said the first thing that he will do is to go and visit his daughter. "I am going to see my daughter Dominique, I waan kiss her," he said.Asked if he had any regrets, Blake replied, "about what? ".Blake was whisked away in a tinted vehicle, driven by his attorney George Soutar. More than 30 persons who supported Blake converged outside the CIB headquarters and when the vehicle that was transporting him drove out, they shouted his name.One woman who walked behind the vehicle as it drove along East Queen Street yelled "Vivian Mi fren".He and other members of the Shower Posse were given lengthy sentences based on 52 charges brought by Federal prosecutors. These included racketeering, smuggling and distributing marijuana and cocaine from the Bahamas through the United States.The Shower Posse, which was strong supporter of the Jamaica Labour Party (JLP), was also implicated in over 1,000 murders in the US. The 'Feds' said the Posse members operated lucrative illegal drug rings in Miami, New York City, Philadelphia and Virginia.Blake was raised in West Kingston, a constituency that has backed the JLP in general elections since the 1960s. He attended St George's College where he passed three GCE subjects, but went to the US in 1972 on a football scholarship.He was one of the Shower Posse's founders, reportedly ruling it with an iron hand. They were regarded as one of America's most dangerous gangs during the 1980s when the narcotics trade was booming in that country's urban centres. 36-year-old man was fatally shot after he engaged lawmen in a gun battle at Doctor Bird Circle, Aviary Housing Scheme, Old Harbour, St Catherine, yesterday. A semi-automatic pistol was seized in the incident.Dead is Fitzgerald Thomas, otherwise called ‘Chis’, of Doctor Bird Circle.Reports are that about 5:45 a.m., a team of police went to Thomas’ home to execute a warrant on him. On entering the premises, they were met with gunfire. The lawmen took evasive action and returned the fire. After the shooting subsided, the area was searched and Thomas found suffering from gunshot wounds. The weapon, a .45 Colt semi-automatic pistol, serial number 001722, with two .45 cartridges was taken from him. He was taken to the Spanish Town Hospital where he was pronounced dead. Personal possessions of the gangland criminals raised more than £100,000 when they went under the hammer on Monday night.Two pairs of cufflinks fetched nearly £15,000, while a letter from the artist Francis Bacon to Ronnie sold for £7,400. One buyer alone spent more than £50,000.Photographs signed by musicians Barbara Streisand and Mark Knopfler, actress Patsy Kensit and TV presenter Fern Britton, raised a total of £1,310.Other goods included a signed copy of comedian Norman Wisdom's autobiography, dedicated to Ronnie, clothes and poems by the brothers.Also among Chiswick Auctions's 160 lots to sell were Ronnie's revered oil paintings, popular with collectors.The notorious pair, who were jailed for life for the murder of Jack McVitie in 1969, dominated London's crime scene in the 1950s and 60s. They went on to develop a cult-like status among the public and celebrities alike. A spokesman for Chiswick Auctions William Rouse said: "It was extraordinary, and there's been an extraordinary group of people in the sale room. "The interest has been phenomenal from the beginning. 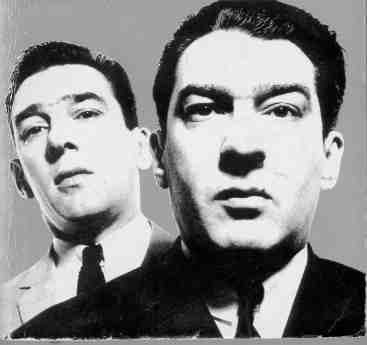 "A solicitor's letter to Reggie Kray explaining his refusal for parole in May 1995 was included in the sale, making £600. He was freed in 2000 aged 66 because of his deteriorating health, and died shortly afterwards.Ronnie Kray died in prison in 1995 aged 61. Vivian Blake, the man who is said to have operated one of the world's most powerful criminal networks may be on Jamaican soil by the end of this week.The infamous shower posse head was released from the confines of prison in the first week of January. Since then preparations have been made for his return to Jamaica. Blake's Attorney David Rowe told RJR News on Monday morning the arrangements for his return are now complete. However, he was unable to reveal the scheduled date of Blake's return because of a bilateral secrecy agreement. "The arrangements are now complete between US Homeland Security and the Government of Jamaica for Mr. Vivian Blake to be repatriated to Jamaica. The precise date is still going to be confidential but all parties have completed their arrangements and his repatriation is eminent," said Mr. Rowe. The former Tivoli Gardens strongman was sentenced to 28 years in federal prison in June 2000 in a Miami Federal Court.He served just nine years of that sentence after turning state's evidence.He had been indicted there 12 years earlier, but fled to Jamaica where he had been hiding until his capture. He and other members of the Shower Posse were given lengthy sentences based on 52 charges brought by federal prosecutors.These included racketeering, smuggling and distributing marijuana and cocaine from the Bahamas through the United States. 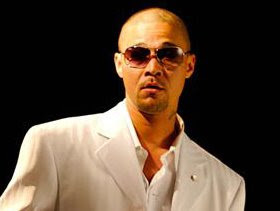 His sentence was shortened after entering a plea deal with US prosecutors.The Shower Posse was implicated in the murders of more than 1,400 persons in the US.US agents said the Posse operated lucrative illegal drug rings in Miami, New York City, Philadelphia and Virginia.Blake was featured on the US Black Entertainment Television's crime series, American Gangster last year. Colin and Dean McCaffrey, aged 24 and 22, were each jailed for 14 years at Sheffield Crown Court after admitting conspiracy to rob UK Bullion on Ecclesall Road in July 2007.Now the pair – described as the ringleaders of the raid – have had their sentences slashed to 10 years each, meaning they will be automatically released after five years when they have served half of their term.Lord Justice Moses, sitting in London's Appeal Court with Mr Justice Pitchford and Mr Justice Griffith Williams, said the brothers had been involved in a "meticulously planned robbery" which had netted an enormous amount of jewellery.The brothers, from Manchester, were part of an organised crime gang which travelled from Manchester to stake out the jewellery store before ramming the shutters with a Toyota Corolla in broad daylight and reversing at speed.Wearing white boiler suits and balaclavas, they burst inside, wielding claw hammers, crow bars and an axe. They smashed all the display cabinets and snatched valuables from the safe.Some employees managed to flee upstairs but others were forced to lie on the floor throughout the terrifying ordeal and one female shop assistant was threatened with an axe.After ransacking the shop in just 60 seconds and stealing watches and diamonds, they sped away in a black Audi, then transferred to other vehicles.But witnesses saw the men passing the gems between vehicles and they were arrested in Manchester the following day.Colin and Dean, described in court as "ringleaders", were caught through a combination of forensic examination work, the monitoring of hours of CCTV footage, number plate recognition systems and mobile phone analysis.Almost the entire stock taken but only £127,000 worth of jewellery was recovered by police. They dropped some jewellery as they fled and earrings worth £6,000 were found in a raid on a house in Merseyside.Lord Justice Moses allowed the appeal which was made on the grounds insufficient credit had been given for the brothers' young age and guilty pleas. latest victim of the drugs boss was Michael 'Roly' Cronin, who had fallen foul of the gangster in a dispute over money.Cronin (35), and one of his associates, James Maloney, whose funeral took place yesterday, were both shot in the head in the front seats of their English-registered car by a gunman who was known to them and who had been sitting in the back of the vehicle.Gardai say the prime suspect for the shooting has not been seen since the killings. They are awaiting the outcome of detailed forensic tests on the murder weapon, a .357 Magnum and clothing dumped by the gunman as he made his escape on foot through Gloucester Place.Meanwhile, four of the five people arrested on Thursday by gardai investigating the double murder were still being held last night at the Bridewell, Coolock and Store Street garda stationsThe three women and one man were all detained at their homes in the north inner city. A second man was released yesterday without charge.Gardai have foiled a suspected 'hit' on a major gangland figure after intercepting a car in north Dublin. The intended victim, officers believe, is the leader of one of the biggest crime gangs in the capital -- and is alleged to be responsible for ordering the double murder in the north inner city last week.He has been blamed for masterminding at least three murders since he took control of the drug-trafficking empire that was left leaderless after the shooting of Martin 'Marlo' Hyland at a relative's house in Scribblestown Park, Finglas, in December 2006.Uniformed gardai were on patrol in the Dunsoghly area of Finglas on Thursday night when they noticed a car being driven in a suspicious manner.The gardai followed the car, which then sped off into the Dunsoghly estate, off the Ratoath Road, where the gardai saw one of the two occupants throw an object over a wall and into the garden of a house.The gardai intercepted the car at Cappagh Road and detained two men, aged 30 and 27. One of the men is from Finglas and is associated with the victim of one of the murders alleged to have ordered by the gang boss. The second man is from the Oriel Street area of the north inner city.After a search of the garden, gardai recovered a loaded pump-action shotgun. Inquiries established that the shotgun had been stolen in a burglary in Drogheda.Last night, the two men were being held in Finglas and Blanchardstown garda stations under section 30 of the Offences Against the State Act. They can be detained without charge for a maximum of three days.Gardai say the drugs gang boss and one of his accomplices have addresses in that part of Finglas and they believe the shotgun was to have been used in an attack. 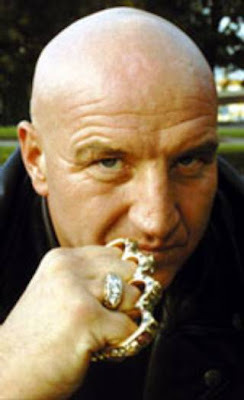 Reformed GANGSTER Dave Courtney has avoided a prison sentence after a Bristol judge heard the criminal turned-author had taken a new direction in life. Courtney, 49, author of a number of best-selling true crime books, appeared at Bristol Crown Court on Tuesday afternoon to admit a charge of possessing ammunition - a single bullet – without a firearms certificate. But after Judge Ticehurst heard Courtney, from Plumstead, south London, had the round in his possession for a prop in a stage show, in which he encourages wayward youths to keep on the straight and narrow, he let him off with an 18-month conditional discharge. Courtney, who claims to have had links with notorious criminal siblings the Kray brothers, has a long list of antecedents including affray and theft – all of which are chronicled in his numerous books. But Courtney's counsel Donal McGuire told the judge his client, who has also starred in various movies and documentaries, now spends his days raising cash for community centres and lecturing would-be crooks with his mantra "crime doesn't pay". Prosecutor Simon Morgan told the court Courtney was pulled over by police on October 29, 2007, in Lewins Mead, in the city centre, because the red BMW he was in had the illegal licence plate BADBOY1. Officers searched Courtney and his vehicle and found the live ammo in his pocket, as well as a number of other prop weapons in the boot. Mr Morgan said: "He told officers it was for a show. He displayed these as part of his performance. He was taken straight into custody where he said it was blank ammunition. "He was extremely surprised to learn it was in fact live ammo. The officer tells me his surprise was in fact very genuine. "But the simple point is, a man with his record, he should know better." Disgraced ex-FBI agent John Connolly Jr. "crossed over to the dark side,"
Disgraced ex-FBI agent John Connolly Jr. "crossed over to the dark side," said Miami-Dade Circuit Court Judge Stanford Blake. The sentence will run consecutively to a 10-year racketeering sentence.Connolly, 68, was convicted in November of second-degree murder in the death of businessman John Callahan, an executive with World Jai-Alai. Callahan's bullet-riddled body was found in the trunk of a Cadillac parked at Miami International Airport.Connolly's fall from celebrated mob-buster to paid gangland flunky captivated a South Florida courtroom for weeks. In testimony at his sentencing hearing last month, he denied having any role in Callahan's death. "It's heartbreaking to hear what happened to your father and to your husband," he told members of Callahan's family. "My heart is broken when I hear what you say." He explained, in the face of vigorous cross-examination, that rubbing elbows with killers and gangsters and winning their confidence was part of his job. His attorney argued that Connolly did what the FBI wanted him to do, and now was being held responsible.Connolly did not testify at his trial.Prosecutors had asked that Connolly be given a life sentence, saying the 30-year minimum was not enough because Connolly abused his badge. In a Boston Globe interview published last month, however, Connolly vigorously denied being a corrupt agent. "I did not commit these crimes I was charged with," Connolly told the newspaper. "I never sold my badge. I never took anybody's money. I never caused anybody to be hurt, at least not knowingly, and I never would. "During his two-month trial, jurors heard that Connolly told his mob connections that Callahan, 45, was a potential witness against them, setting him up for the gangland-style slaying.According to testimony, Connolly was absorbed by the very gangsters he was supposed to be targeting -- members of South Boston's notorious Winter Hill gang. His story was said to be the inspiration for the character played by Matt Damon in the 2006 Martin Scorsese movie, "The Departed." Connolly's tale was closely followed in New England, where he grew up in Boston's "Southie" neighborhood, the same area long dominated by the Winter Hill gang and its notorious leader, James "Whitey" Bulger. Sought in 19 slayings, Bulger is the FBI's second most-wanted fugitive.During the first two decades of his FBI career, Connolly won kudos in the bureau's Boston office, cultivating informants against New England mobsters. Prosecutors said Connolly was corrupted by his two highest-ranking snitches: Bulger and Stephen "The Rifleman" Flemmi.Connolly retired from the FBI in 1990 and later was indicted on federal racketeering and other charges stemming from his long relationship with Bulger and Flemmi. 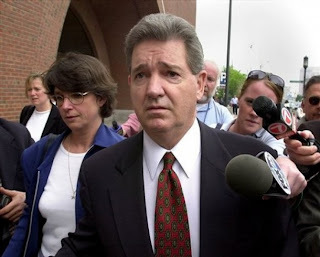 He was convicted of racketeering in 2002 and was serving a 10-year federal prison sentence when he was indicted in 2005 in the Callahan slaying.During testimony, jurors heard that Connolly was on the mob payroll, collecting $235,000 from Bulger and Flemmi while shielding his mob pals from prosecution and leaking the identities of informants.The prosecution's star witnesses at the Miami trial were Flemmi, who is now in prison, and mob hit man John Martorano, who has admitted to 20 murders, served 12 years in prison and is now free.Callahan, who often socialized with gangsters, had asked the gang to execute Oklahoma businessman Roger Wheeler over a business dispute, according to testimony. Martorano killed Wheeler in 1981 on a golf course, shooting him once between the eyes, prosecutors said.After Connolly told Bulger and Flemmi that Callahan was going to implicate them in the slaying, Martorano was sent to do away with Callahan, prosecutors said.But one star witness did not testify -- the former FBI agent who inspired the 1997 film "Donnie Brasco." He refused to take the stand after the judge denied his request to testify anonymously. Pedro Sanz,well-known Calgary gangster is cooling his heels in jail after breaching curfew. Pedro Sanz, well-known Calgary gangster is cooling his heels in jail after breaching curfew.Police were investigating a shooting in the community of Dover last night. CPS Spokesperson Kevin Brookwell says they came upon the man partially by chance. Police were looking for a black car in relation to the shooting when they noticed another car with a person in it that they recognized. They stopped that car and arrested Pedro Sanz, who was wearing body armour at the time. Murder of Roly Cronin who had been involved in the drugs trade imminent arrests. Murder of Roly Cronin had been involved in the drugs trade since his teens, and he received a 13-year sentence for possession of heroin in 1996. He enjoyed the usual trappings of drugs wealth -- expensive holidays, upmarket cars and a generally lavish lifestyle. He lived with his partner and child in Buckingham Street, a short distance from where he died, for a number of years but had moved to Finglas last year, apparently after running into trouble with other drug dealers in the north inner city.GARDAI have obtained crucial DNA evidence from the Magnum pistol used in the killing of Michael ‘Roly' Cronin and his driver. Officers are expected to swoop on the chief suspect for the double murder in the coming days in an effort to match his DNA to the sample recovered from the powerful pistol used in the shooting. Dozens of officers are this weekend hunting the man in his 30s they suspect of the hit - an associate of drug boss Cronin's from the north inner city. The second man shot in the incident, James Moloney, from Poppintree in Ballymun, died yesterday afternoon from his injuries. He had been on life support at St James's Hospital since being shot twice in the head as he sat beside Cronin. A breakthrough in the case occurred last night when preliminary forensic tests on the gun yielded a DNA sample, which gardai believe belongs to the killer. A source told the Herald: "It's a key piece of evidence and the next step is obviously to match it to the hitman. "We have a chief suspect and we are trying to locate him this weekend. But we're keeping an open mind and there'll be a few other people we'll need to speak to as well. "The case is progressing slowly but surely. Given the nature of DNA analysis, it could take four to six weeks to get a full match." The main suspect is known to gardai and was friendly with Cronin in the past, and officers believe that this friendship explains why the gang boss allowed him into his car at Langrishe Place, off Summerhill, last Wednesday night. As the black Volvo S40 drove off, the gunman fired one shot at Cronin and two at Moloney before fleeing. He dropped the murder weapon, a Magnum .357, under a car at Gloucester Place, and also discarded a black jacket and gloves nearby -- all of which have been recovered by gardai. Forensic tests are continuing on the jacket and gloves, and gardai are hopeful of obtaining DNA from one if not both pieces of evidence. The source added: "It's rare that a hitman would leave so much evidence at the scene. He was obviously panicking as he ran from the car on Summerhill down into Gloucester Place." Moloney, in his 20s, was an associate of Cronin's. He was originally from Poppintree, but more recently lived at Braithwaite Street in the south inner city. He had been on life support since the shooting last Wednesday but a decision was made yesterday to switch off the machine. While Cronin was a major drug trafficker, Moloney had no criminal convictions. Moloney had been warned in recent weeks there was a hit out on his boss and told to stop working for him. The remains of Cronin, who was originally from Ballymun but had also lived in the north inner city and Finglas, will be released for burial in the coming days. The dad of one was released from prison four years ago, after serving a 10-year sentence for drugs possession. After his release from jail, he aligned himself to Marlo Hyland's Finglas-based crime gang, while also running his own business in areas from Ballymun to Poppintree. Officers are examining a number of motives for Cronin's killing, but the chief line of inquiry is that he fell out with other criminals in the north inner city over cash owed for drugs. Gardai in the city divisions on both sides of the Liffey expressed concern last week that the new young gangs, aged mainly in their late teens and early 20s, are causing a great deal of trouble. They are putting intense pressure on their younger teenage street dealers and any drug seizures by gardai or losses of earnings are punished with severe violence. These gangs are mainly involved in heroin dealing. They are also unafraid of the established, older gang figures in the city. Gang leader described by police as a thrill-killer was sentenced to death Friday for murdering gang rivals and trying to kill police officers. Superior Court Judge Robert J. Perry agreed with the recommendation of the jury that 35-year-old Timothy McGhee should be put to death. The judge said McGhee's crimes were unprovoked and showed no consideration for human life. McGhee treated his crimes "as some kind of perverse sport, as if he were hunting human beings," Perry said. McGhee appeared in court surrounded by three deputies. Authorities said he was the highest-ranking gang member in the city's tough Atwater Village neighborhood. He was convicted in October 2007 of killing two gang rivals and a woman. Ronald Martin, 17, was shot 28 times as he sketched a picture along the Los Angeles River. Prosecutors said Ryan Gonzales, 16, was killed because he and McGhee had the same nickname—"Guero," which is Spanish for someone with light skin. Margie Mendoza, 25, was fatally shot while she was in a sports utility vehicle with her boyfriend. The two police officers were led into gang territory and ambushed in 2000. They escaped injury after McGhee opened fire on their patrol car. Three other gang members have been convicted and sentenced in the crime. Jurors who convicted McGhee also upheld special circumstance allegations of multiple murders and murder to further the activities of a criminal street gang, which made him eligible for the death penalty. He previously received a sentence of 75 years to life for taking part in a riot at the downtown Men's Central Jail in January 2005. McGhee had been placed on the U.S. Marshals Service's most-wanted list before his February 2003 arrest in Bullhead City, Ariz. He's been in jail since then. Robert Mayberry picked-up in Atlanta for distribution of heroin. He'll have to come back to Cincinnati to face charges here. Police are taking a more aggressive approach to gang activity. They're hoping this latest arrest shows gang members even if they run, eventually police will catch them.Suspected members of a gang called the Taliband saw a show of force from police-- rounded up with cameras rolling. Officers hope it sends a message. "If you are out here involved in gang-related behavior not only will the individual that committed the offense be targeted, but that entire group will be targeted." Tuesday, the long arm of the law reached from Cincinnati to Atlanta and tapped suspected gang member Robert Mayberry on the shoulder. Police say the man who went by the name "One Eyed Kenny" in Avondale streets was picked up by U.S. Marshals. Officers credit a tip from Sofast and the Cincinnati Initiative to Reduce Violence program, called CIRV. "It's a collaborative effort of not just Cincinnati police, but also federal marshals, prosecutors, probation officers. We're bringing in the whole gamut of law enforcement judges." Officers believe Mayberry was the head of the "Grimmie Gang". He fled Cincinnati when police arrested most of the gang about a year ago. Officers recently arrested suspected gang member Kenneth Milton and eight others for violent crimes in Kennedy Heights and Pleasant Ridge. The youngest member of the Coleridge Boys is actually an 11-year-old girl. "However, it definitely sends a message that we need to be doing more reaching out to the children in the community and letting them know that this is definitely not the path to go down." The 11-year-old suspected gang member is accused of breaking into a couple's home and threatening the homeowner with a gun in her waistband. Sergeant Danita Kilgore says in her experience finding a gang member that young is atypical.Numerous members of the Grimmie Gang have recently gone to trial for murder. Many of them agreed to plea deals that sent them to prison. It’s been one of the last unsolved mysteries from the gangland career of John Gotti. Whatever happened to the neighbor who accidentally ran over and killed the mobster’s John Gotti. 12-year-old son Frankie — and then vanished?The answer may be found in Brooklyn court papers filed this week by federal prosecutors.They say 51-year-old John Favara was shot to death on orders of the outraged Gambino crime family boss — and his body was dissolved in a vat of acid. Prosecutors say a cooperating witness has fingered a 62-year-old former mobster as the perpetrator in the 1980 affair. Charles Carneglia, an alleged mob soldier awaiting trial on five murders, made sure there was no body to be found by dissolving Favara’s remains with flesh-eating acid, which he kept by the drum in his basement, a government witness testified.“In a later discussion concerning his expertise at disposing of bodies for the Gambino family, which included a discussion of a book [Charles Carneglia] was reading on dismemberment, [Carneglia] informed another Gambino family associate that acid was the best method to use to avoid detection,” government prosecutors wrote in court papers.What happened to Favara has been the stuff of New York lore: In 2004, the federal agents dug up a lot in Queens on a tip that Favara’s remains were buried there. Most recently, the government believed his body was buried in vat of cement and dropped into Sheepshead Bay. Reigo Janes, 27, listened to the case through an interpreter after admitting two counts of robbery and two of possessing an imitation firearm. Reigo Janes, 27, listened to the case through an interpreter after admitting two counts of robbery and two of possessing an imitation firearm. The court heard he was one of four men to target Berry's in April 2006. He carried a hammer, two carried what are believed to be handguns and staff were said to be terrified.They fled with £335,000 worth of watches, including Rolexes, before dropping their weapons – ball bearing guns – at the door.Three months later Janes was part of a gang to target jewellers in Manchester. The raid lasted 29 seconds and yielded watches worth £230,000. They were hidden in a nearby bar toilet's suspended ceiling and picked up by another gang member.Janes was caught through DNA matches after West Yorkshire Police widened their hunt. He was brought back to the UK and admitted the crimes saying he was picked because he was homeless, in debt and had a criminal record. He was paid the equivalent of £3,500 for the Leeds robbery in Estonian kroon. Sentencing him the recorder of Leeds Judge Peter Collier QC said: "I accept you were not the ringleader but you were an able and willing recruit. You did the dirty work. "Speaking after the case Det Insp Lloyd Batley of West Yorkshire Police said: "We were the first force to make the link between the robberies and the gang in Estonia. The raids were meticulously planned and ruthlessly executed. They were in and out in seconds. Janes was sentenced to 12 years to run concurrently for the robberies and five years concurrently for firearms offences. The police say they may give alleged 'Shower Posse' boss and convicted drug lord, Vivian Blake the chance to live like a free man when he returns to Jamaica. While uncertain if Blake was wanted for any crime committed locally, ACP Hines said the police's decision to keep an eye on the deportee depends on risk assessment. "He is a free man so it's all about risk assessing...We are always mindful of an individual's right and the right of the general public. He is not yet in our jurisdiction so we will see," ACP Hines said. According to investigators, Blake is expected to be interviewed and will have to provide information in regards to his place of abode. This they say is in keeping with the monitoring of 'high risk' deportees. Blake is expected to arrive in the island soon after serving a nine-year prison sentence in the United States. He was reportedly scheduled to arrive on Sunday however, local detectives had to alter their plans as he did not enter the island. Blake was sentenced to 28 years in 2000 after pleading guilty to racketeering and criminal conspiracy. His sentence was shortened after entering a plea deal with US prosecutors. He had been indicted there 12 years earlier, but fled to Jamaica where he had been hiding until his capture. The Shower Posse reigned terror on the streets of the US and its members are reported to have murdered over 1,400 people there. In addition to racketeering, smuggling and distributing marijuana and cocaine from the Bahamas through the United States, the Shower Posse was also implicated in more than 1,000 murders in the United States under Blake's leadership. The group has been accused of trafficking huge amounts of cocaine into the US and using the profits to send firearms and ammunition back to Jamaica. The gang was said to have operated major drug networks in New York, Miami, Philadelphia, New Jersey, Los Angeles, Alaska, Washington DC, Dallas, Houston, Kansas City, Montreal, Toronto and London. On December 18 of last year, Blake was featured on the Black Entertainment Television's American Gangster, a crime series in which he was quoted as saying "I ran it like a CEO of a Fortune 500 company. The only difference is that instead of litigating in a court of law, we held court in the streets." The programme looked at the rise and fall of the Shower Posse which has its roots in the west Kingston community of Tivoli Gardens.